An early heads up for you in video form this morning about a great new addition to BackupAssist’s Exchange Granular Restore functionality. 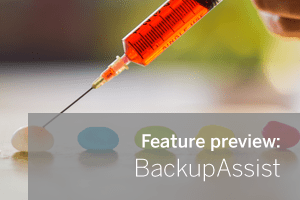 Pencilled in for release in the next couple of weeks, v7.3 of BackupAssist will provide you with the ability to quickly find items in your Exchange database backup, and directly restore them to another Exchange server. Stay tuned for notification of the release and by all means feel free to get in touch via the comments section if you’ve got any questions.